I've read all kinds of conflicting info on the web so I really don't know for certain what a standard Mach 1 package consists of. I do know that the standard Mach1 package grew as the engine option grew. So how much of the above information is not correct? NASA hood with 2 (plugged) scoops and ram-air was non-functional. Competition suspension (front/rear sway bars, heavy duty shocks/springs, staggered rear shocks). Mach1 comfort-weave seats with 2 colored stripes (the stripe color could be contrasting or only slightly different as the rest of the seat) . It currently still has the origional paint and all the same decals. In 71 the hood was functional if you had a 4v engine. I'm pretty sure competition suspension wasn't standard either, because magnum 500 wheels come standard with that package I believe, and many mach 1's have hubcaps. As far as I know they all had the stripes on the seats though. Mine has a 4v engine and the hood scoops were plugged (and definatly came from the factory that way). Ram-air was AVAILABLE with the 4v in 71 but it was not part of the Mach1 pkg. Competition suspension WAS standard on the Mach1. Mag-500s were not. The NACA hood was not standard on Mach 1's. It was a no charge option, therefore most have them. It was not fuctional without the ram air option. The non-NACA hood was standard. I believe staggered shocks were not available on 351 2V and smaller engines. Standard interior was also available in Mach 1. They did not necessarily have the Mach 1 interior. 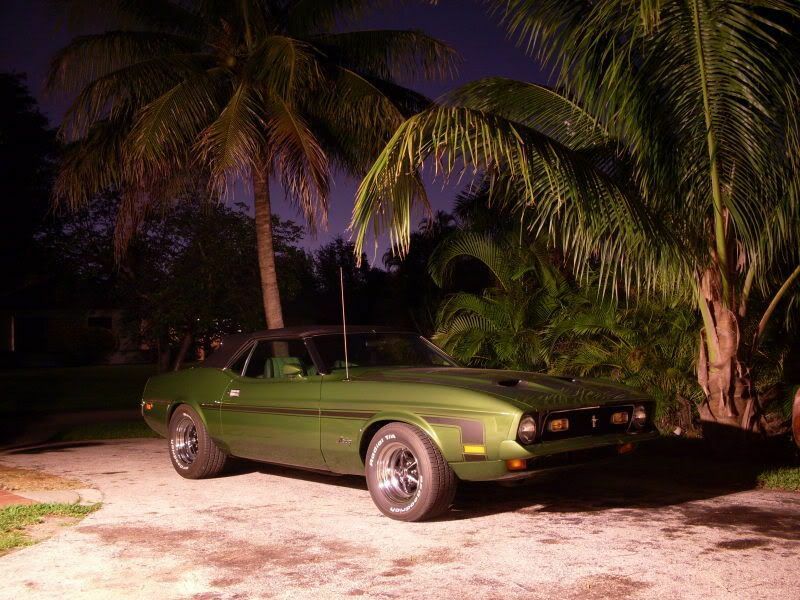 1971mach1;16742 Wrote: Mine has a 4v engine and the hood scoops were plugged (and definatly came from the factory that way). Ram-air was AVAILABLE with the 4v in 71 but it was not part of the Mach1 pkg. You are so right about everything, I don't know where I got that info from. Let's pretend I didn't post that last post.....feelin a little off my game here today. The one glaring discrepancy is that the ram air option was available on 72 351 4V...it was not available on the 73 351 4V. Keep in mind that Ford classified the hoods under three (3) different types: Standard Sportsroof; NASA (NACA) Hood; and NASA Hood with Ram Air. Over the years, the NASA hood has been almost universally referred to as the "ram air" hood, although the car may or may not have ram air. 71mach351;16747 Wrote: The NACA hood was not standard on Mach 1's. It was a no charge option, therefore most have them. It was not fuctional without the ram air option. The non-NACA hood was standard. I've been doing some research and apparently although all mach 1's came with competition suspension, it consisted of slightly different things according to the year and engine. From what I read you are absolutely right about the suspension. All 72-73 mustangs (mach 1 or not) with a Q code engine got the competition suspension apparently too. All the hood stuff is correct too. I read both ways on the interior but imma take your word for it. Competiton suspension was an option, 4 Speeds got staggered shocks, automatics got regular unstaggered shocks. rear sway bar was a seperate option. Widowmaker00;16750 Wrote: I read both ways on the interior but imma take your word for it. A buddy of mine is the original owner of a 71 Mach he ordered from the factory in early 71. Being a teenager he only dropped the cash for the good stuff he could afford,( 351C 4V ram air). He liked the standard interior better so thats what he got. The mach 1 interior was an option that cost extra.